TuesdayArtGroup: Comic Fest Guy and Fest Lad! I spent a few nights on this promotional piece for the Comic Fest. The idea was to take the cover of Captain America 193 and turn Cap into Comic Fest guy, a mascot designed five years ago by Scott Shaw! I wanted to use CA 197 where Cap was alone, yelling to no one, with missiles flying between his legs, but the powers that be liked this composition with the shield rounding through the knee up through the Falcon, leg, and fist. 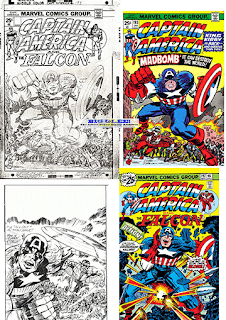 When Mike Towry saw an image issue 193 on my phone he didn't even think it was Kirby because of the strong Romita inks. I found online a xerox of a stat of the pencils and inked them in Illustrator working with 5 different line profiles. The penciled head was kind of undramatic so I picked up the head from issue 200's pencils that I found. I put the crowd in silhouette to save time and because Scot Shaw! had silhouetted characters on his logo (see sdcomicfest.org). Colors had to be changed since the characters are dressed in gold and red instead of blue and white. I have no ideas what do put on the shield and was flummoxed by the Kirby crackle. Romita drew flames and smoke. I gave the shield some volume to evoke a bit of Guardian. I found fonts "American Purpose" and "FantastiFont". This is out for comments. It may be this year's T-shirt. Sweet job Ben. Got that Kirby impact for sure. Kirby crackle looks good. Amazing work considering it sounds like it had to survive coming out of committee. I think I'll flip through some Jimmy Olsens to see how the Guardian's shield was squiggled. Nice line work. All illustrator. Pretty impressive. There have been alterations, but this is the shirt. 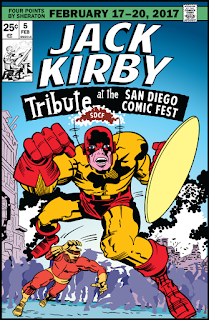 We added a big star in a circle on the shield and instead of concentric circles of color there are radiating triangles of gold and red sort of like on the logo sdcomicfest.org. The fest T-shirt guy has my files, and I do not know what changes he and the printer are making. It is not like I have ownership of the project or anything.